EASY OPERATION. 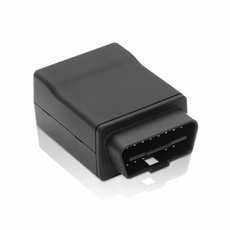 Simply plug the OBD-II GPS tracker onto your vehicles OBD-II port and start tracking immediately. RELIABLE NETWORK COVERAGE. TFL's OBD-II GPS vehicle tracker communicates on America's most recognized 4G LTE nationwide network. REAL-TIME MONITORING. Locate and monitor your OBD-II GPS tracker equiped vehicles up to the second through our TFL web portal or mobile app. ALERTS AND REPORTS. Receive real-time email and scheduled reports via email or dashboard/mobile app notifications. Create geofences and get alerts notifiying you of vehicle movement in various points-of-interests. Receive speeding notifications. Generate execessive engine idling reports. Generate mileage reports for expense reports. Get notified of vehicle use outside of normal operating hours. Receive reminders for mileage and time related maintenance. DRIVER SCORE CARD. Keep your drivers accountable for sensible driving. Driver scores are analyzed by the following criteria: harsh braking, sudden acceleration, sharp turns, reckless driving, and speeding. Whether you're managing a fleet of service vehicles or have a new driver in the family, ensuring your drivers are responsible by using safe and efficient driving habits can be a challenge, but it's not impossible. Tracking For Less (TFL) offers an easy and affordable solution that can save your business money and keep those you care about safe. TFL's Eco-Driving feature generates driver scorecards based on five violation criteria that include rapid acceleration, harsh braking, sharp turns, speeding, and reckless driving. These allow managers and administrators opportunities to evaluate their drivers on a daily, weekly, or monthly basis and address concerns or reward those who exercise the highest level of sensible driving. When you're looking for the best interest of your business or loved ones, or just looking for peace of mind, consider TFL as a partner in promoting responsible driving, protecting your most valuable assets, and offering cost-saving solutions at an affordable price. That is why we are called Tracking For Less.